It has taken me a while to post anything and it is because I’ve become lazy every time I think about going to the movies or starting a new book. 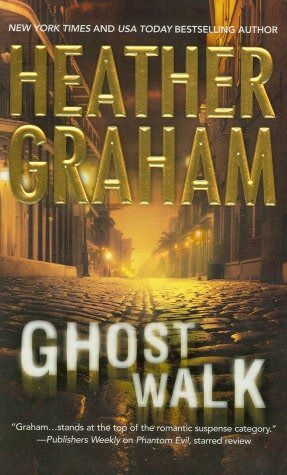 Luckily, I could finish Ghost Walk by Heather Graham and I hereby posted my review. Waking from a daze at four o’clock in the morning, Nikki Du Monde sees at the end of her bed the image of Andy asking her for help. She dismisses the sight as a prank, though hours later she learns that Andy died at precisely the time she saw her. Was Andy’s sight a ghost? Absolutely. Nikki must learn to communicate with the beyond if she wants to stay alive, for it seems that the dark forces that took her friend’s life are intent on taking hers as well. Meanwhile, Brent Blackhawk, a paranormal investigator, is sent to New Orleans to probe Garfield’s death. Brent learns that Garfield’s ghost is making appearances around the city and he partners with Nikki to conjure the agent’s ghost to find out the motive behind his killing. I liked this book, though I found the ending implausible; not the general idea, just the way the conclusions were arrived at and further explained as if to make sense of it all. Despite that flaw, the rest of the story is compelling and engaging, the characters very well outlined. The legends of New Orleans are as quaint as the city itself. I felt the urge to book a trip! The romance is scorching hot, and despite of making me almost forget this is a mystery, I found it quite refreshing. This is the second book I read by Heather Graham. I previously read Ghost Shadow, which I also reviewed in this site.